To a great extent histories of photography, especially early histories, are descriptions of the evolution of techniques and processes. 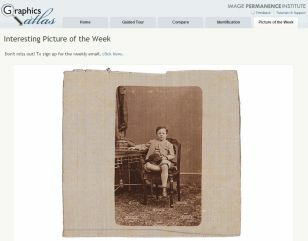 Check the History and Criticism tab for more resources on photographic processes. Stulik, Dusan, and Art Kaplan. 2013. The Atlas of Analytical Signatures of Photographic Processes. Los Angeles, CA: Getty Conservation Institute. A Getty Conservation Institute resource that offers meticulously researched and lavishly illustrated PDFs on various photographic processes, allowing for extensive analytical investigation of photographs. See the second "Featured Resource" box to the right for more information. *Baldwin, Gordon, and Martin Jürgens. Looking at Photographs: A Guide to Technical Terms. Malibu, CA: J. Paul Getty Museum, 2009. Provides "a series of concise explanations of the terms most frequently used by curators, collectors, and historians to deal with the phenomenon called photography." As it is intended for someone actually looking at photographs, it is limited to terms likely to appear on descriptive labels in exhibitions or catalogue entries. Revised and updated to include digital terminology. Barger, M. Susan. Bibliography of Photographic Processes in Use before 1880: Their Materials, Processing, and Conservation. Rochester, NY: Graphic Arts Research Center, Rochester Institute of Technology, 1980. Intended for those seeking information about photographic processes in use before 1880. Concentrates on photographic journals in English (though some titles from France and Germany and a few general/scientific titles are included) and includes 41 entries for photographic manuals dating back to 1839. Organized by process/material; includes a very broad keyword index. Burbank, W. H. Photographic Printing Methods. (From the series The Literature of Photography). New York: Arno Press, 1973. Reprint of the 1923 publication, which collected information and formulas connected with the production of photographic prints. Includes chapters on the silver bath; toning, fixing,and washing; printing with emulsions; photo-mechanical printing methods, and many more. *Kennel, Sarah, with Diane Waggoner and Alice Carver-Kubik. In the Darkroom: An Illustrated Guide to Photographic Processes Before the Digital Age. NY: Thames and Hudson, 2010. Concise introduction to the 27 most common photographic and photomechanical processes, some still in practice, from the origins of the medium up to the time when using chemicals and a darkroom to process photographs was gradually superseded by digital technology. Each process is illustrated with a representative photograph, accompanied by a drawing showing the layers of image-bearing photographic materials on a support. Includes a glossary of commonly used terms and a timeline. Nadeau, Louis. Encyclopedia of Printing, Photographic, and Photomechanical Processes: A Comprehensive Reference to Reproduction Technologies, Containing Invaluable Information on Over 1500 Processes. Frederickton, New Brunswick, Canada: Atelier Luis Nadeau, 1994. Definitions, explanations, and in some cases illustrations of terminology, technical procedures, equipment, and materials in the field of imaging technology. Cross-references help to clarify relationships between the many terms that were coined and invented in this fertile field. Does not include biographical entries, but an index to proper names allows finding who invented or used what. Each entry includes at least one reference for further reading, and most include many. Includes an index of German terms. This edition is a one-volume reprint of two volumes published in 1989 and 1990, so there are two sets of indexes that must be consulted separately. Victoria and Albert Museum. A Guide to Early Photographic Processes. Edited by Brian Coe and Mark Haworth-Booth. London: Victoria and Albert Museum in association with Hurtwood Press, 1983. Provides a guide to the recognition of the major photographic processes from 1840-1914, illustrating the finest examples of each process. Includes an essay by Elizabeth Martin on the care and conservation of photographs. Includes a glossary and a timeline showing when given processes were used. Organized by chemical and physical classes: silver prints, iron-based processes, and then processes using pigments including printing inks. The George Eastman House has created a series of videos that explain and show a variety of different photographic processes, including the Daguerreotype, Talbot's processes, the cyanotype, the albumen print, pigment processes, and many more. "The Atlas of Analytical Signatures of Photographic Processes is intended for practicing photograph conservators, curators, art historians, archivists, library professionals, and anyone responsible for the care of photograph collections. Its purpose is to aid in the formulation of analytical questions related to a particular photograph and to assist scientists unfamiliar with analysis of photographs when interpreting analytical data. The Atlas contains interpretation guides with identification of overlaps of spectral peaks and warnings of potential misidentification or misinterpretation of analytical results." In addition to lavishly illustrated downloadable PDFs on individual photographic processes, the site offers access to an array of videos on photographic processes and materials created by Getty Conservation Institute staff, a video on the scientific analysis of the world's first photograph, a video on the chemical innovations of photography, and links to other articles and related projects. Graphics Atlas is a sophisticated resource that presents an object-based approach for the identification and characterization of prints and photographs.